Keaton has been in the golf industry for over seven years. He was born and raised in Elk Grove, CA where he played two years of college golf before attending the Phoenix Golf Academy of America. At the GAA, Keaton received a degree in Golf Complex Management as well as teaching, club fitting, and a passion for teaching golf. 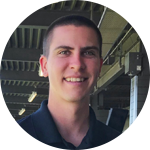 Keaton has been teaching golf for multiple years in California and Arizona ranging all the way from beginners to advanced players. He is extremely excited to be a part of the Topgolf family and looks forward to working in the great city of Tucson as well as sharing his love for the game of golf.